I was lucky to stumble upon this fantastic Track Wisdom series of advice written by private racing coach Peter Krause in response to popular threads on various high performance driving/racing bulletin boards. My favorite write-up was on the “Tenths” and their appropriate use on the track. As you will find out below, the real fun starts at 6/10s! Viper Club of America has just released this video of the race-only Viper ACR-X pulling off a 7:03 lap time around the Nurburgring. This lap time is very impressive considering it's 10 seconds faster than the street-legal Viper ACR's time! The 7:03 time is a track record for a factory vehicle produced by a large manufacturer. To be fair, the Ferrari 599XX has managed a 6:58, the Radical SR8LM has posted a 6:48 lap time, and the Pagani Zonda R tops both with a time of 6:47. But I don't think any of these 3 (even Ferrari) can be considered a large manufacturer. They don't call Dakar The Most Dangerous Race in the World for nothing. Here's a very cool and amusing compilation of adventures over the rally's first 30 years. No wonder bikes get the bulk of the footage here - it's a lot easier to see the riders than the drivers. Private racing coach Peter Krause shows some terrific moves in this onboard video from the Gold Cup Historics at VIR in June 2010. At the start of the race, Peter gets shuffled back to fifth from a third place starting position. He reclaims forth place back form the orange Lola, then back to third past the silver/blue and yellow Swift, then second after the leader falls off in Turn 4, and finally, the awesome pass for the lead coming out of Hog Pen. I love the tussle during the first pass at 0:32, the bold pass on the outside at 3:50, and the final pass for the lead at 6:12. Amazing moves and spectacular racing action! During a recent visit to the Napa Valley, I had the chance to stop by and check out Infineon Raceway. Infineon, formely known as Sears Point, is just a few miles North of San Francisco and a stone's throw away from Napa and Sonoma. It looks like an amazing track and the facilities are top notch. It is a 2.22 miles (3.57 km), 12-turn course with some serious elevation changes. I timed the visit perfectly and was lucky enough to get there just as Ferrari Challenge race team R3 Motorsports was out on track testing the new Ferrari 458GT. What a car! What an insanely good soundtrack!!! South Florida-based Xtreme Indoor Karting has the best Valentine's Day Promo for couples that love racing! The $49 package comes with 2 eight-minute race sessions, 2 cocktail drinks, arcade game cards and 2 rounds of mini golf. Sounds like a dream Valentine's day to me. I think I'm in love! OK, so I have to admit this video almost fooled me when I first watched it. How can a formula car (or any car!) go triple-digit speeds on snow and especially in single-digit temperatures when everything is iced up!? Well, they sort of cheated!! 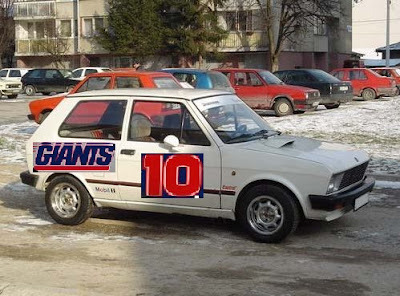 Can you guess which car will win the Superbowl XLVI race?